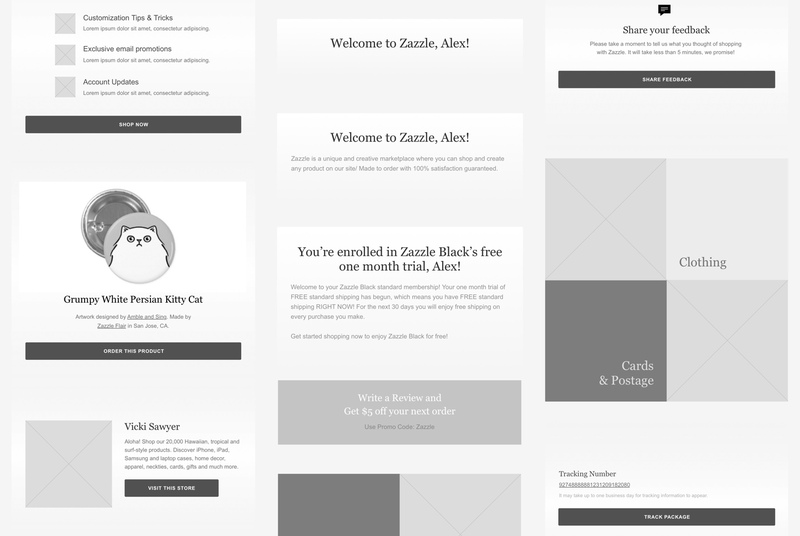 Zazzle worked with ZURB to rethink and redesign their automated emails, creating a unique matrix of personalized touchpoints with their customers. 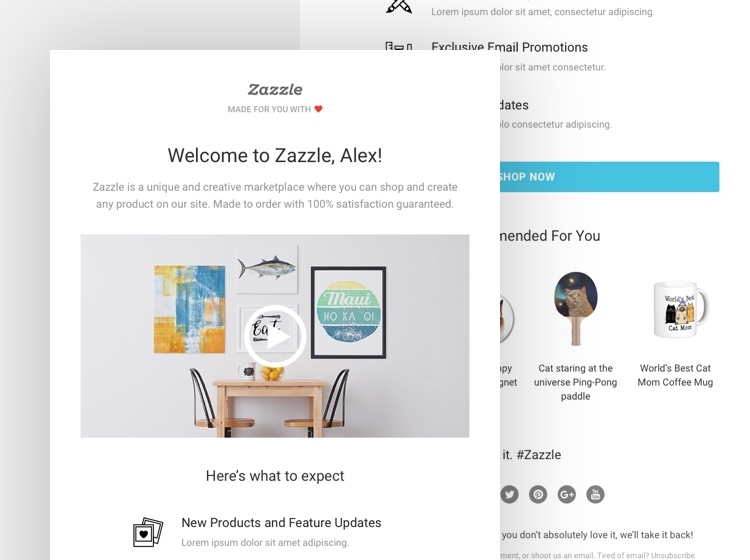 Zazzle is a global online marketplace that allows designers and customers to create their own products with independent manufacturers, as well as use images from participating companies. 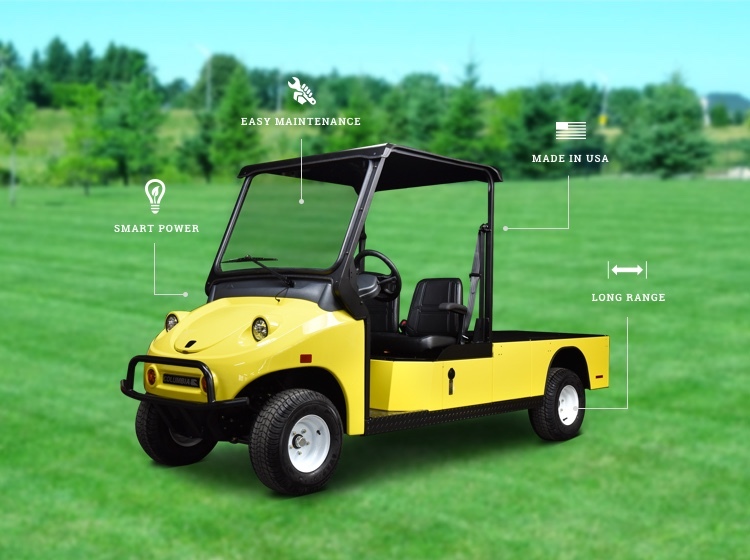 Zazzle enables people to make just about anything, and no that’s not hyperbole. Browse their site and you’ll see thousands of products that people can customize with their own art, branding, or logos and sell on their own sites or in their own stores. 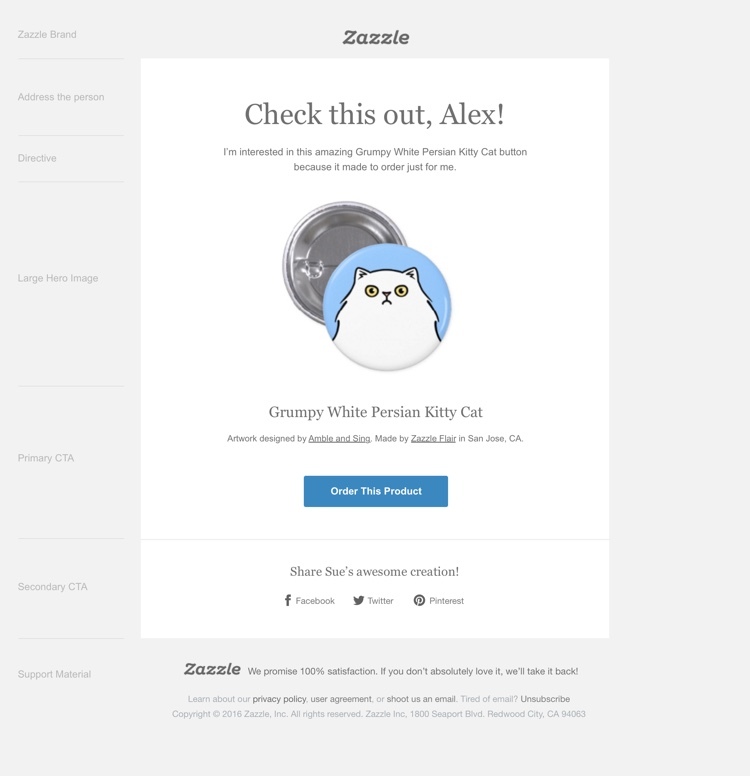 To keep the relationship strong with their customers, Zazzle uses well timed emails which they’ve divided into two buckets, transactional and promotional emails. 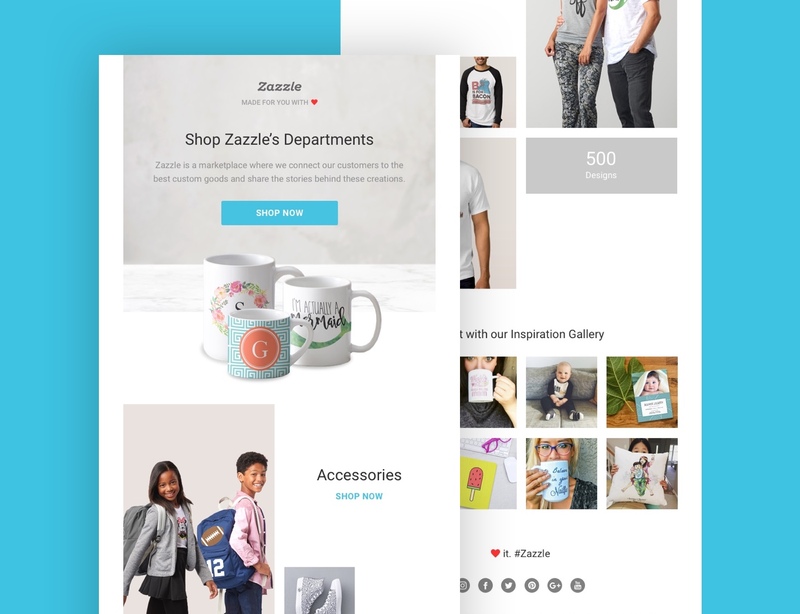 Zazzle wanted to redesign their emails to enhance the their growing brand, show the value of the platform and optimize their engagement to create a great experience for their customers. Zazzle customers are more engaged when emails have personalized, event-driven call-to-actions to create and customize their own products. With that knowledge in mind, we starting building a framework with easy to use pieces and components that their team could use to build any number of emails quickly and easily while retaining the visual and content consistency. In the email world, frameworks are a new concept as many companies either code emails from scratch or rely on rigid templates. While helpful for some things, templates lack the flexibility of the framework approach and can be difficult to modify. 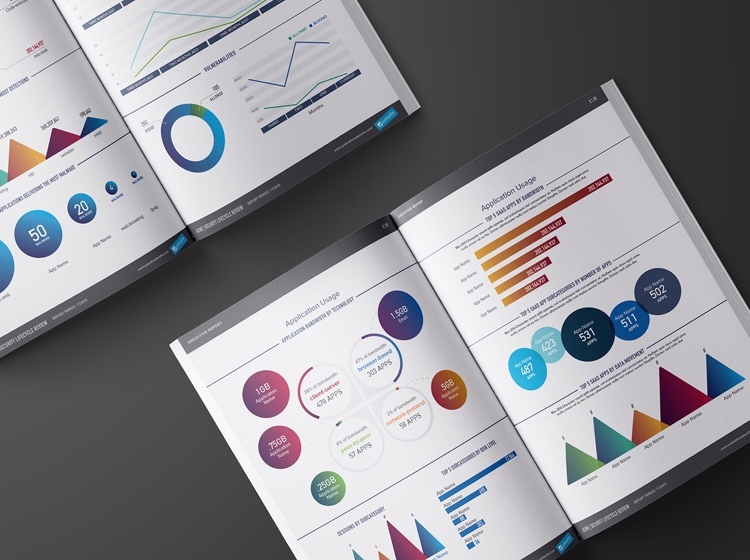 Any new variable often requires creating a new template and increases the chance of straying from brand guidelines. By creating a custom framework system, the Zazzle team would be able to mix and match components and build new emails as needed. We designed each of these components as coded partials that could be used to created a wide variety of email types and still be customized to create that personal connection with their customers. Additionally, having one primary CTA ensured that each interaction had focus and purpose, helping direct people to content, events, and information that is relevant to them. 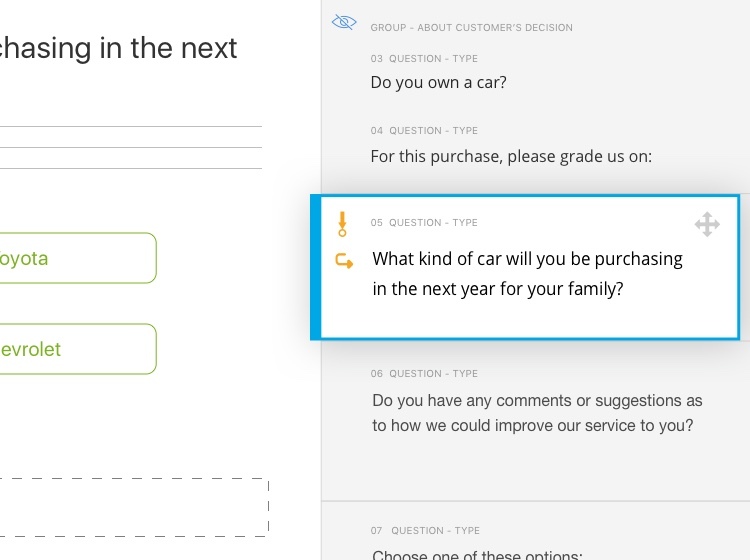 This fresh framework approach to email balanced with the Design Insight learning of the need for personalization and clear directives, helped us create a unique system that sends the right message, to the right people, at the right time.